The Harrier is V/STOL (Vertical/Short Take-Off and Landing) close-support and reconnaissance fighter-bomber aircraft that served with the British Royal Air Force (RAF) during the Falklands War. During the war, the RAF's Harrier GR.3s operated from HMS Hermes and were used in close support of ground forces and attacked Argentine positions and Port Stanley runway. Additionally, the Royal Navy operated Sea Harriers during the war, and these concentrated on air defence missions. In the even of Sea Harrier losses, the plan was to use Harrier GR.3s as replacements, but in the event this was unnecessary since no Sea Harriers were lost in combat (although two were lost from ground fire, and four from accidents). 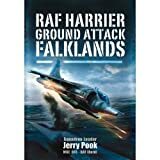 During the Falklands war Jerry Pook, a pilot in No. 1(F) Squadron RAF, flew air interdiction, armed reccon, close-air-support and airfield attack as well as pure photo-reccon missions. Most weapons were delivered from extreme low-level attacks because of the lack of navigation aids and in the absence of Smart weapons. The only way he could achieve results was to get low down and close-in to the targets and, if necessary, carry out re-attacks to destroy high-value targets. Apart from brief carrier trials carried out many years previously there had been no RAF Harriers deployed at sea. The RAF pilots were treated with ill-disguised contempt by their naval masters, their professional opinions ignored in spite of the fact that the RN knew next to nothing about ground-attack and reccon operations. Very soon after starting operations from the aircraft carrier HMS Hermes the squadron realized that they were considered as more or less expendable ordnance. The Harriers lacked the most basic self-protection aids and were up against 10,000 well-armed troops who put up an impressive weight of fire whenever attacked.